The University of North Dakota (UND) has the state’s only medical school program and admits 78 students per year into its four-year program, which educates medical doctors as well as occupational and physical therapists. When the university needed help solving challenges in its facilities, it turned to IoT technology and solution provider AVI Systems. Originally founded in Bismark, ND in 1974, AVI was able to bring the winning combination of local familiarity and global experience to the project. AVI Systems was tasked with finding an efficient way to accelerate collaboration and synergy between disparate locations and equipment. The separation of programs on campus left UND’s faculty, staff and students split between multiple buildings and isolated to specific areas. Because of this division, those who were a part of the School of Medicine and Health Sciences (SMHS) faced significant limitations when it came to collaborating with one another. Rigid lab spaces did not allow for the flexibility researchers needed, while the arrangement of equipment in work spaces within the labs made them even more individualized. This was made worse by the fact that the office space for faculty and staff encroached on the lab area, which further limited what could be done. Adding to the complications, the school’s Simulation Center lacked much-needed space for both students and faculty. The solutions needed for the facility were more complex than simply updating lab equipment or adding furniture. The new building needed to accommodate larger classroom sizes and provide the audiovisual (AV) technology solutions needed to efficiently and effectively educate competent, qualified healthcare professionals. Additionally, the building needed to facilitate easier communication and socializing between students from different disciplines, while enabling the school’s faculty and staff to collaborate with greater ease. All of this led to UND’s four-pronged plan, the “Healthcare Workforce Initiative,” which addresses the state’s healthcare workforce needs, including reducing the burden on disease, retaining more graduates in North Dakota and improving the healthcare delivery system. Fortunately for the university, the funding for the project was there, as a shortage of healthcare workers had prompted the North Dakota Legislature to approve $123.7 million in funding to build a new, 325,000 sq. ft. SMHS building. The approval set a record, being the largest state-funded building project in North Dakota. To achieve its goals, the school needed a vast improvement in its infrastructure, including AV technology solutions. In addition to the help of local and national architects and construction companies, AVI Systems was tapped as the solution provider that could best deliver the AV and IoT connected capabilities that would allow the university to realize its goals for the future. The new building layout was constructed in a north-south design with classrooms and small-group rooms lining its “Main Street.” In addition, it features open collaboration spaces with built-in connectivity. This layout acts as a bridge between the east and west sides of the building, which house faculty and research. The new design provides much more flexibility, making it easy for the lab to grow or shrink to give students and faculty more or less room depending on the needs of the individual project. Other changes such as moving lab equipment into a centralized area for better access helped improve the efficiency of the space as well. These improvements translate into a more user-friendly, collaborative space, one where students can fluidly utilize the equipment. Much-needed updates to the university’s Simulation Center have greatly improved the work being done within the facility. The updates incorporated six simulation rooms—two more than the old Simulation Center—14 standardized patient exam rooms and five debriefing rooms, which are equipped with displays for video conferencing. 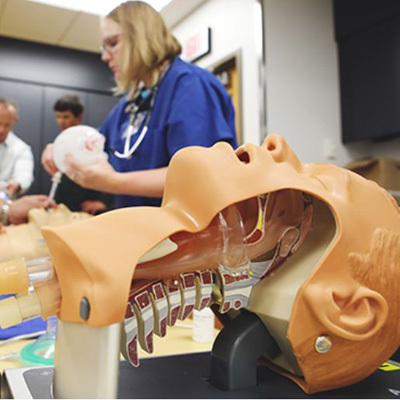 Part of the simulation suites are multiple high-tech manikins and computer technology that simulates real-life patients, helping prepare UND’s students for the numerous scenarios they are likely to face as healthcare professionals serving their community. Thanks to the new AV technology upgrades, collaboration throughout the building is easier than ever before. With many of the classrooms now able to facilitate more active learning, the school has seen a positive impact on student learning outcomes, according to Gwen Halaas, UND’s senior associate dean of education. With technology consistently available throughout the new building, the ability to find a connection and take advantage of the new and existing solutions can now be achieved quickly and easily. All classrooms are outfitted with smart classroom technology, which includes scheduling and monitoring capabilities, interactive discussion tables, large-screen projectors, streaming and more. The design and implementation of the new facility’s IoT-powered technology solutions have revitalized the way students, faculty and staff work together and interact with one another on a daily basis. Download the full case study on the UND project from AVI Systems. Learn more about how AVI technology and IoT solutions are enhancing physician-patient relationships and collaboration.